Since today is the birthday of Sir Terence David John Pratchett, better known to the world as Discworld author Terry Pratchett (Happy Birthday, Sir Terry! ), we’ve compiled a list of our favourite one-liners and wise remarks from the master of comic fantasy. 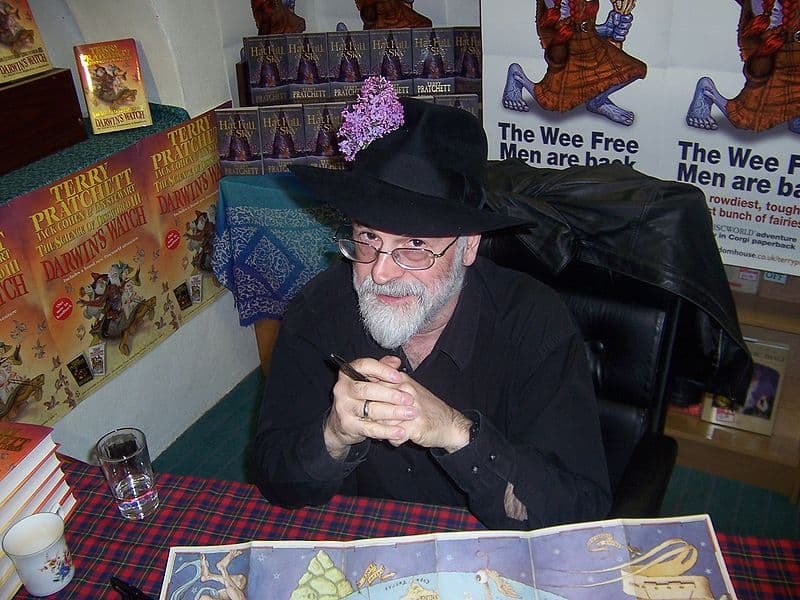 We hope you enjoy these fine Pratchett quotes. Image: Terry Pratchett, by Myrmi, Wikimedia Commons, free licence. I adore Terry Pratchett, I have all his books from the Carpet People to Snuff. My mum began my love by reading the Truckers trilogy to me. Even on the tenth or eleventh reading his books reveal something new. He is a wonderfully talented author. You can do a lot worse than beginning your child’s love of reading by sharing the wonderful humour of Terry Pratchett with them. They wouldn’t let me borrow from the adult library when I was a kid because I only had a juvenile ticket. Definitely “no” to age banding – good on you, Sir Terry! He is one of the funniest and most intelligent authors I have ever read. Long live Discworld! Thanks for sharing these great quotes. My favourite was: ‘I’ll be more enthusiastic about encouraging thinking outside the box when there’s evidence of any thinking going on inside it.’ – ‘Thinking outside the box’ is a prime example of business jargon that has permeated the English language in recent years. I’ve always wanted to tweet that one as I think it would strike a chord with many people sick of business jargon and management speak, but if I recall correctly it overshot the 140 characters a little. It’s a great quotation, though – it was good to be able to include it here! Thanks – will have to have a read of your poems! Bend the mind Terry, the straight and narrow is for tunnel vision. I do so Love Terry Pratchett’s work…I think I’ve read about everything he’s written, a wonderful idea to celebrate his birthday! I do so agree with you, he’s wonderful, and I’m always surprised when someone hasn’t read him…thoug probably normal. Today is Terry Pratchett’s birthday and this is a beautiful tribute to his great work! Haha…god forbid he be accused of that. Yes, they do :) and that is why he is so great :) good job! Ooh how exciting! Your son also shares his birthday with Harper Lee (who was 88 on Monday)! “stranger than usual things were happening all the time”. Perfect quotes: they should be emblazoned in every classroom, library, public space, workshop or office, and tattooed on the forehead of every Minister for Education, here and around the world. I love the bit about Tolkien’s attic. So true! Oh how I love Sir Terry, let me count the ways….where to start? Thank you for these quotes. I love them. As I knew I would. I’ve got 3 quotes that are my favorites from this. It was a tough decision.